Mix the flour, sugar and melted butter. Spoon (or use your fingertips) the mixture into the bottom of the mini muffin tins. Bake for 10 minutes at 350 F. Remove from the oven and set aside while you prepare the filling. 125 gr butter / 1 stick plus 1 Tb. Combine the golden syrup, butter and condensed milkin a large saucepan and cook over low heat for about 10 minutes, or until it thickens and takes on a golden color. Remove from the heat, let cool for a minute and divide among the tart shells. Bake for 20 minutes. Remove from the oven and let cool completely. Melt the chocolate in the microwave or on top of a double boiler. Add the oil and mix well to combine. 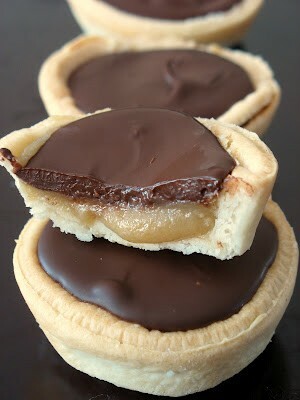 Spoon some over each tart shells and allow to set in the fridge. Verdict: I doubled up on the quantities to make sure I had some for us and the girls at work tomorrow and I am glad I did. These disappeared while the host was pouring coffee. I am looking forward to making them again.